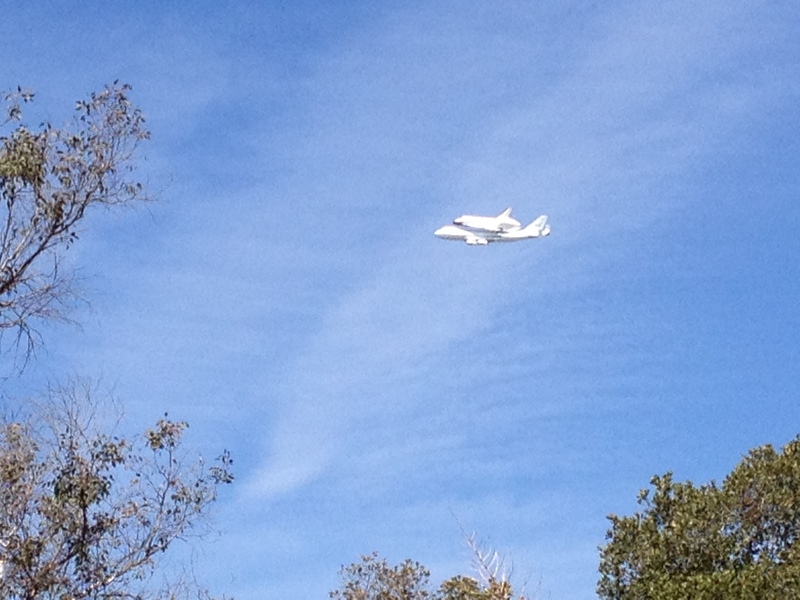 But, that was this morning, before Endeavour made its way over my neighborhood. Yesterday I asked my daughter if she was interested in seeing the shuttle flying attached to the back of a “really big plane.” She was interested until I told her she would have to miss school. Upon that realization she replied, “No, I can just see it at the Museum (The California Science Center) later and be a lot closer to it.” That was all I needed. I wasn’t going to make it a big deal. I try not to get sucked into hype. We live about a mile away from the Jet Propulsion Laboratory’s east entrance. As the Laboratory was one of the shuttle’s fly over destinations, the streets were buzzing pretty early around our neighborhood. One prime viewing spot was full hours before the shuttle was scheduled to arrive. But, I went on with my day as if it were any other. The shuttle’s flight was delayed, pointing its arrival time about the time my daughter gets out of school. After scooping her up, I decided to take the freeway home. We never do this, always choosing the more scenic, back route that hugs the base of the San Gabriel Mountains. But, I thought, if this thing was flying into the city we would be sure to see it from the freeway. We traveled the seven miles or so and no shuttle. I had a local news radio station on saying it had just left the Santa Monica Pier, and at that moment I decided we were going to make an effort to see it. As I took the freeway exit that points us in the direction of home, I quickly scanned my brain for best possible locations to view the shuttle fly over in my neighborhood and chose one. Of course, hundreds of other people also had chosen that spot. Never the less, I miraculously found a parking spot very quickly. We hopped out of the car and two minutes later, the shuttle was coming into view. The crowd cheered, and I was filled with delight and awe, emotions I was not expecting. It was really very amazing. Maybe it was because I grew up with the shuttle program, or grew up with a scientist mom who loves the space program. I remember sitting in our backyard waiting to hear the sonic booms on the occasions that the shuttles landed at Edwards Air Force Base. I remember exactly where I was and what I was doing when I learned that the Challenger exploded during launch. I was saddened the day the Columbia broke up on re-entry. It was over in just a couple of minutes. On the drive home I recalled another occasion where I almost missed a “once in a lifetime opportunity.” I was traveling in Peru and having a difficult time being “just a tourist.” I had come directly from a very meaningful six month stay in Nicaragua, and was conflicted about being in Peru with no real connection to the politics or people of that country. I was considering skipping Machu Picchu because I was sort of disgusted by a lot of tourist behavior and knew that was where everyone was headed. My dad urged me over the phone to go see it, that I may never get the opportunity again. I listened and was not disappointed. Peering over that ancient space, I was in awe the same way I was in awe today watching the shuttle on the back of the 747 gliding slow and low. This time, though, it would have been impossible for me to miss. 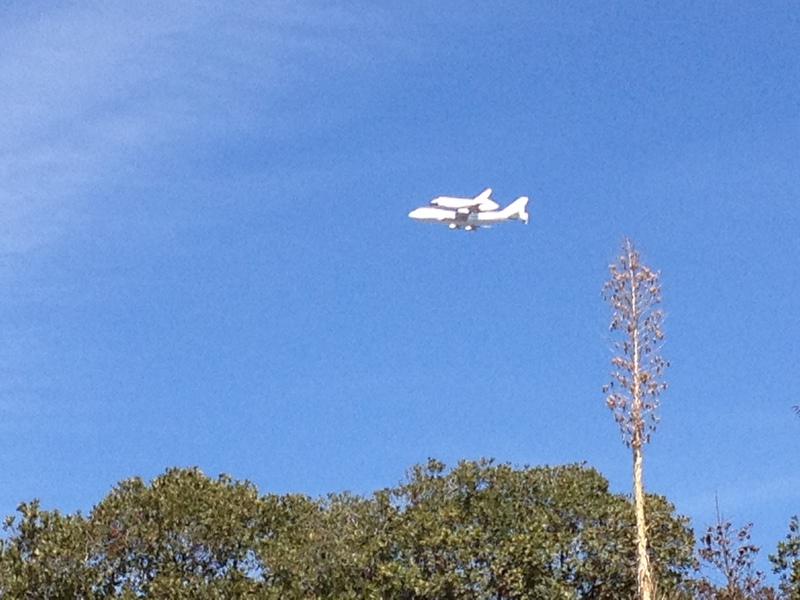 After seeing photos taken by friends who live near by, I now know we could have seen the shuttle fly by from our front porch! Sometimes the off-topic posts are our best! Great reminder to seize the moment! Thank you, and yes, it is sometimes hard to remember to seize the moment. Thank you! I wasn’t sure if I should post it, and now I am glad I did. Personally, I think that the off topic subjects just provide great highlights to the “real” subject of my/our blogs………. it’s all connected, anyway,right? Thank you so much for your comment. I was inspired by another off topic experience a while back and chose not to write about it on the blog. I can’t even remember what it was now I am a newish blogger and try to be careful about blogging “etiquette.” But, I think you are right, off topic is fun and interesting sometimes. Thanks again!